An excellent gift for a special person's birthday! 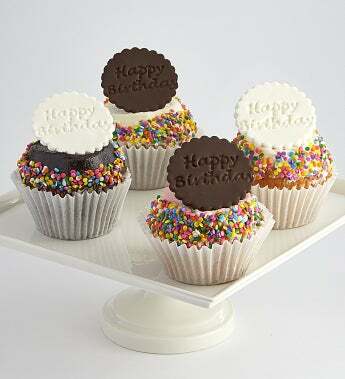 These jumbo filled cupcakes arrive in a gift box and have Happy Birthday greetings right on the cupcake. Little Whisk has created these delicious morsels in 4 classic flavors - chocolate, vanilla, strawberry and red velvet. The perfect way to celebrate them in a BIG way! Kosher, OKS. Total net wt. 1.5 lbs.